As Man Ray launched into his Shakespearean Equations project, he reworked a canvas from 1940 titled Disillusion. 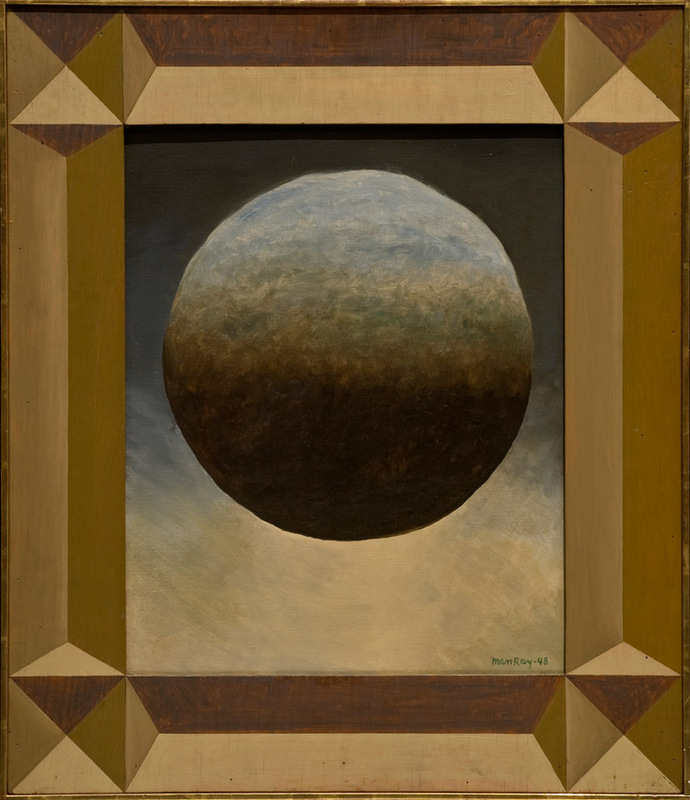 Transforming the composition into As You Like It, the artist removed the disembodied hand, changed the globe-like sphere into a celestial form, and encased the floating orb in a rectangular trompe l’oeil frame. 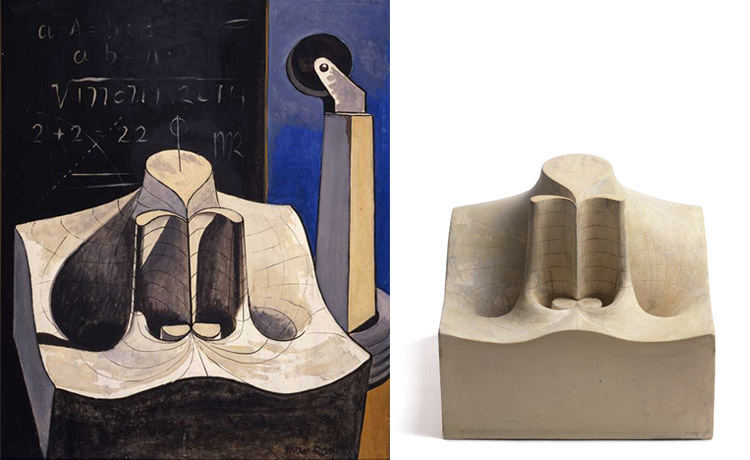 Although not inspired by any specific mathematical model, this painting opens a window into the evolution of the Shakespearean Equations series, as Man Ray re-conceptualized geometric forms and introduced them in new contexts. Julius Caesar epitomizes Man Ray’s inventive approach to humanizing and translating mathematical models into enigmatic forms in his Shakespearean Equations series. In this composition (at left), he mapped out the undulating lines defining the model, creating a headless torso and casting the transformed object as the central character in a theatrical tableau. Note on the blackboard behind the imposing form barely discernable mathematical equations such as “2 + 2 = 22.” These seemingly illogical mathematical notations embed further mystery in Man Ray’s characteristically enigmatic manner. In the space between two relational formulations on the blackboard the artist posed the philosophical question and unsolved problem of the “square root of Man Ray.” The answer to and meaning of this conundrum is left for us to decipher for ourselves. Of his Shakespearean Equations, Man Ray once stated “In painting [the models], I did not copy them literally but composed a picture in each case, varying the proportions, adding color, ignoring the mathematical intent, and introducing an irrelevant form sometimes, as a butterfly or the leg of a table.” In his rendering of Julius Caesar, he recycled the table leg employed in his 1945 object Obelisk see Oculist (Pied à terre) to evoke the scepter of a triumphant general. Do you see anything else in this painting that might evoke Shakespeare’s Julius Caesar? Above is an example of what you’ll see in Man Ray–Human Equations: A Journey from Mathematics to Shakespeare, opening in less than two weeks. The exhibition centers on Man Ray’s (1890–1976) Shakespearean Equations, a series of paintings inspired by photographs of mathematical models he made in Paris in the 1930s. Within the galleries, you’ll see the original mathematical models, Man Ray’s inventive photographs of the objects, and the corresponding Shakespearean Equation painting displayed side-by-side for the first time.